What has been dubbed as Australia’s first Offshore Patrol Vessel (OPV), the Multi-Role Aviation Training Vessel (MATV) MV Sycamore will arrive in Sydney on Monday, 26 June. The Damen-built ship is arriving three months ahead of schedule after successfully completing sea trials in April this year. Damen said the new ship will provide jobs in NSW for the next 30 years, with representatives inside the company envisaging the operation and maintenance of this ship to provide a boost of $50 million to the NSW economy during its service. During the sea trials, in addition to the more traditional elements of sea trials such as manoeuvring and speed tests, Damen said Sycamore was put through her paces with an extensive testing program of all onboard military systems. This included testing of the air traffic radar, flight deck lighting and firefighting, flight deck communication systems and helicopter traverse installation procedures. Damen Asia-Pacific sales director Roland Briene said the firm was pleased with the results of the 94-metre long vessel during the sea trials. "We are proud to hear that the MV Sycamore has passed her first tests with flying colours," Mr Briene said. 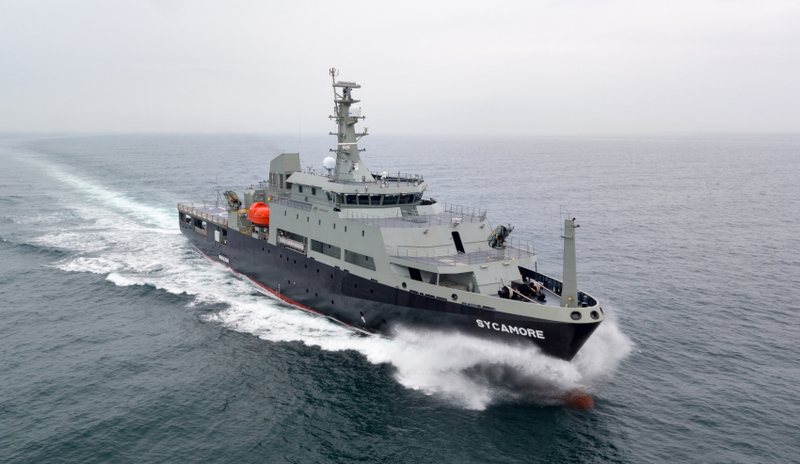 "Based on Damen's successful and proven OPV series, the MATV is a very versatile ship." Damen also added that the MATV will enable the RAN to accomplish numerous other secondary tasks, such as undertaking torpedo and mine recovery operations, navigation training, dive support, officer sea familiarisation, target towing and consort duties, as well as unmanned aerial vehicle support.